Habey has recently unveiled HIO Project, a $100 ARM Linux board designed for rapid prototyping powered by Freescale i.MX6 dual lite or quad, and shortly after, the company launched a Kickstarter project for HIO Wallpad, an in-wall Power-over-Ethernet touch controller for home or office automation embedding HIO Project boards. The main power can work on standalone, and you can insert one or more daughter boards, at the top or bottom of the main board. In the picture above the main board is apparently coupled via the PoE board and HIO-PNL1280-IWK daughter board. The company can provide the Android SDK, and a Linux SDK is also in the work. 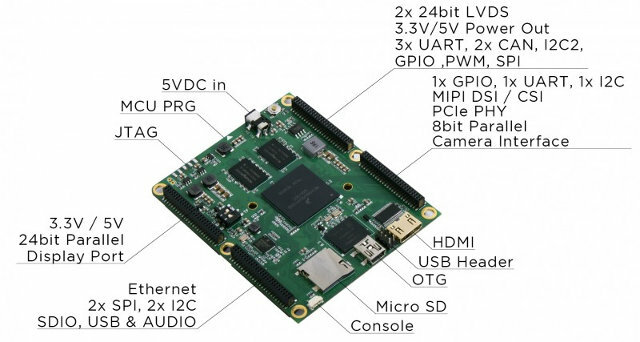 The IO boards, panel boards, POE boards and other daughter boards, add-on modules developed for the HIO Project should become open hardware, albeit not the main board. The boards should become available at the end of May , but you can now reserve the main board (Dual Lite) for $99.99, PoE board for $59.99, IO Board for $19.99 and a 5V/3A power supply for $12.99. Shipping varies between $12.99 and and $39.99 depending on your location. Strangely, HIO-PNL1280-IWK board shown in the first photo does not seem to be available for reservation. You can find details more on HIO Project website. If you’re feeling lucky, you could also participate in the giveaway “competition” to get one of 5 free kits. HIO Wallpad kickstarter project showcases HIO Project capabilities, and allows you to connect and control your entire home or office automation system via a single PoE Ethernet cable for data and power, albeit there’s also Wi-Fi connectivity as an option. 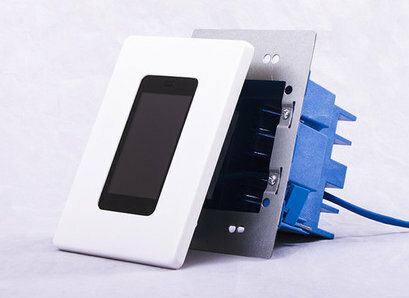 It’s basically like a 3.5″ Android phone that you’d insert in your wall running Android 4.2.2 or, soon, Linux.